Home » Clothing of the Greek in ancient times. Top row left: Priestess. Noble Greek women with peplum. Right: Greek commanders in armor, shield, sword and lance. Bottom row left: Winner in the Olympics. Bacchus priest. Greek king with regalia. Right: Clothing of Greek country peoples. 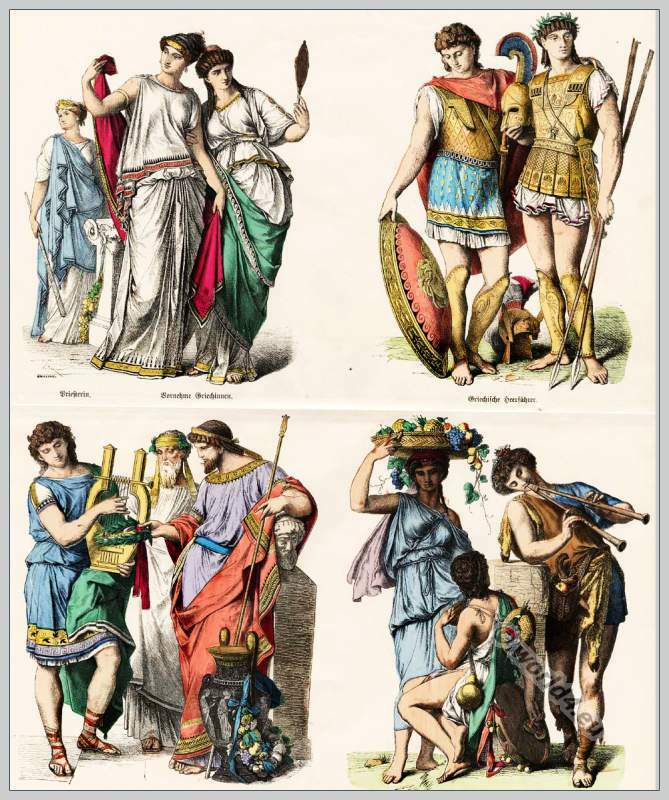 The Ancient Greek Costume History. Gallery: On the history of costumes. From Ancient to the 19th century. This entry was posted in Ancient, Ancient Greece, Hairstyle, Military, Nobility and tagged Ancient Greek Costumes, Münchener Bilderbogen on 1/24/14 by world4.